Adapted for the screen by writer David Nicholls (who makes a much better effort rewriting Dickens for the screen than he did his own novel One Day), Great Expectations is a straightforward take on the story of Pip’s humble beginning until he is endowed with great expectations by a mysterious benefactor. Jeremy Irvine stars as Pip and the actor shows considerable growth since Steven’s Spielberg’s War Horse. Raised by a common blacksmith named Joe (Jason Flemyng) and his coarse wife (Sally Hawkins), Pip laments his poor upbringing. Pip’s life gets a jolt of excitement when he comes to the aid of a grisly escaped convict (a strong Ralph Fiennes). As proof of the boy’s good heart, Pip helps the outcast man by stealing his aunt’s savory pie and his uncle’s file. The convict is captured nevertheless, but his visit gives Pip a taste of the stimulation that exists beyond Joe’s little cottage. Pip then receives a strange offer. A lonely old woman in London requests his presence at her large empty house. Miss Havisham (Helena Bonham Carter) likes to occupy her time by seeing children as they play; she especially likes it when boys take a shine to her ward Estella (played by Holliday Granger in the adult years), whose beautiful looks seem destined to break hearts forever. Besides her pleasure in watching children, Miss Havisham is a strange old woman. She was abandoned at the altar and, as everyone who read the book in tenth grade English knows, she never shed her wedding dress and now lives frozen in time amidst cobwebs and an extremely mouldy wedding cake. Miss Havisham is equal parts mad, wounded, and fanatical, and much like Norma Desmond in Sunset Blvd. – you’ll remember that Joe Gillis references the character in the Billy Wilder film – she constructs an elaborate façade around herself in order to keep the past alive. Helena Bonham Carter is the ideal Miss Havisham. The eccentric British actress often looks as if just she stepped out of Charles Dickens novel whenever she walks a red carpet in real life, so Bonham Carter looks right at home in Miss Havisham’s tattered dress (the costumes of the film are excellent) and her Bride of Frankenstein hair-do (the make-up is also quite good). 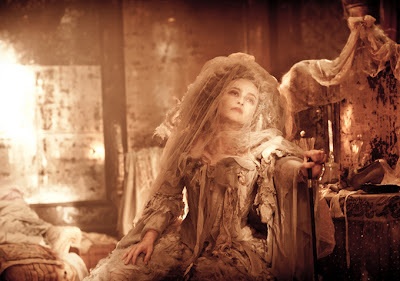 Miss Havisham is the one character from the novel that enables ample scene-chewing, and Bonham Carter makes the most of this delicious role and steals the film with every scene she appears. Pip’s relationship with Miss Havisham continues after he grows up and receives his surprise news of a trust fund granted to him by an anonymous stranger. Pip’s dream of moving to London and becoming a gentleman are fulfilled. He immediately splurges on all the latest fashions so that he can appear the part when he arrives in London. However, once Pip lands in the booming metropolis, he sees that the city is actually a dirty cesspool of muddy thoroughfares and debauched youth. It’s also never really clear what the occupation of a gentleman entails: Pip spends his days with fellow trust-fund babies, but they’re more akin to soccer hooligans than noble gentry. This version of Great Expectations uses Pip’s story to offer a critique of Victorian society that readers might not have had the insight to discern during high school English. (I certainly didn’t.) The production values in this cinematic rendering of the ye olde days is faultless, with the gloomy streets of London looking particularly eye-catching, especially as captured through the atmospheric cinematography by DP John Mathieson. Great Expectations also has a spellbinding score by Richard Hartley, which drives the story with classically oriented themes. Most laudable in the film, however, are the choices of actors for the roles, as each part is cast to perfection, with Bonham Carter and Fiennes being key standouts. Fans of the Dickens novel will surely relish this adaptation, which acknowledges the original without being too reverential. Viewers unfamiliar with the book should appreciate it as well. Like the adaptation of Midnight’s Children, which is also playing at TIFF, this rendering of the novel revisions the source into a tale that is accessible for all. Unlike Joe Wright’s Anna Karenina, however, Great Expectations doesn’t try to further the complexities of the novel into a particularly new cinematic experience; consequently, its limited take on the novel might prevent Great Expectation from climbing that extra step in page-to-screen efforts. While this take on Dickens doesn’t do anything new, though, it’s a healthy piece of cinema nevertheless and is one of the stronger conventional adaptations of classic literature to hit the screen in some time.